If you want to get inspired about Canada, about Canadian politics, about the qualities that make so many of us proud to call this country home, forget the people running for election and go listen to Margaret Trudeau speak. On Sunday afternoon, I attended a fundraiser in Kingston in which Trudeau was the headline speaker. Bubbly, warm, radiant, hilarious and tear-provokingly candid, Trudeau showed more spirit in one half-hour than either Stephen Harper or Michael Ignatieff has demonstrated in two weeks. 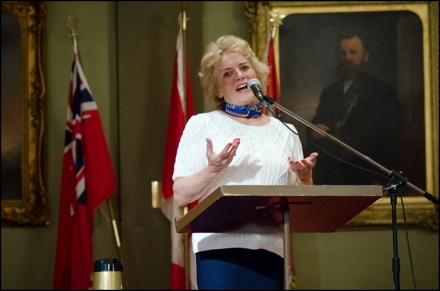 In describing her fight with bi-polar disorder, she told the audience at Kingston City Hall about hitting “rock bottom” after the deaths of her son, Michel, in 1998 and then her “beloved Pierre” two years later. “I wore a mask, so many of us wear masks to hide who we are, and it was so much effort to keep that mask on,” she said in a moving account of her struggles and triumphs over mental illness. She declared herself to now be “joyous and happy,” and genuinely looked it. Married at 22, the wife of a Prime Minister, the focus of a nation and now a grandmother, cheerleader for her politician son and staunch advocate for the mentally challenged, Trudeau wants action. When I asked her why mental-health isn’t a topic of conversation among the candidates for the May 2 Canadian federal election, the reply was blunt. While promoting her bestselling memoir, “Changing My Mind,” Trudeau, 62, took a few minutes to answer some more questions about the upcoming election and her past. Here are her statements, some of them given to me, others to the audience at the Horizons of Friendship Fundraiser, which benefits developing communities in Central America and Mexico. On her son Justin Trudeau’s chances of defending his Parliament seat in the Papineau, Quebec riding: “Oh, he’s going to do wonderfully. He works very hard in his riding. He’s a fighter. Other authors in attendance included Karen Connelly, Charles Foran and Carolyn Smart, and singer-songwriter Ian Tamblyn performed. Horizons of Friendship raised $29,000 last year and has raised more than $74 million since 1973, when it was created to fight poverty and build healthy communities in developing nations such as Costa Rica and Nicaragua.